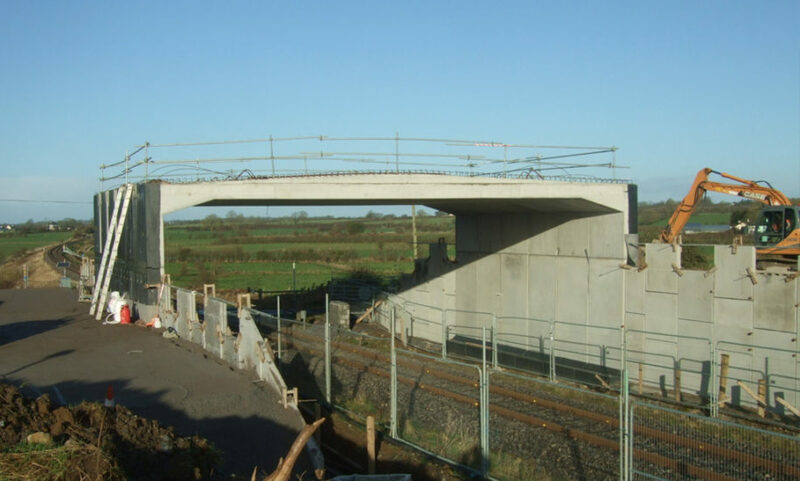 This overpass on a live railway was the first bridge to be designed to the Eurocode standards as well as Irish Rail’s new framework contract. It was also the first portal to be made on the skew. The structure consisted of six rings of 14.5 metres wide x 5.85 metres high Banagher Precast Concrete Portal units plus ten H4a precast concrete parapet panels for the deck. The roof units weighed 55 tonne, the legs 10 tonne and the parapets 6 tonne each. A full trial fit took place in Banagher prior to units being delivered to ensure a safe, efficient and right-first-time fit on site. Our Eurocode design was approved by Roughan and O’Donovan and we successfully installed over a two-night railway possession.